We got to take a last minute vacation recently and decided to visit Charleston, SC. I’ll probably write a couple posts on it, but today, I wanted to give a quick review of a couple of the beaches. 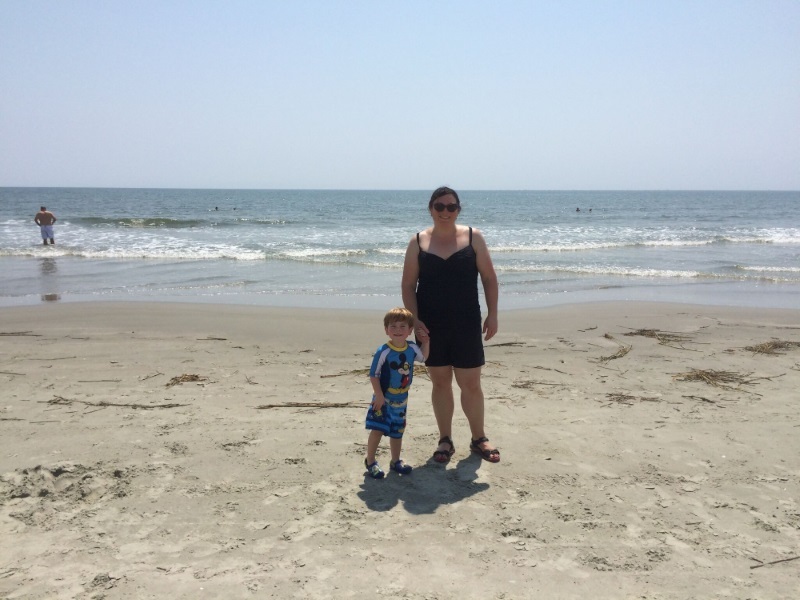 We visited Sullivan’s beach and the Isle of Palms. Sullivan’s Island’s and Folly beaches are the most well-known of the beaches in Charleston. They are certainly large and Sullivan’s Island is a protected barrier island that has lovely sand, not many seashells and fairly tame waves compared to other beaches I’ve been to. Parking was fairly convenient and free. But you have to find it on the many side streets and hope to get within an easy walking distance of the beach. There were no restrooms that I could find. But after only going to this beach, I was seriously thinking it was one of the nicer beaches I’d ever visited. The only trash I found was a small piece that might have come from a cigarette filter, very little kelp washed up, the sand was smooth and easy to walk on. Just a lovely, restful place to spend a day. Sullivan’s also had more and possibly better restaurants than we saw at Isle of Palms. I can definitely recommend this beach. That being said, we tried Isle of Palms at the suggestion of a co-worker and again at another suggestion from the lovely lady serving us at Hello Deli in North Charleston (a deli so good, we ate there three times during our 5 days in Charleston) and that one became my favorite. Isle of Palms is smaller than Sullivan’s. But it is gorgeous. The beach was quiet– granted, we visited here on the Tuesday after Memorial Day, so I’m sure it was packed the day before. The waves here seemed slightly more intense than at Sullivan’s, perhaps just because of the day we came, but I got the feeling Sullivan’s always has comparatively tame waves. There were still very few shells on the very clean beach, but more than at Sullivan’s. On the beach was a beautiful pier that many people used for shade from the sun but also acted as a great little science show for The Boy on where seashells come from. The nicest thing about Isle of Palms, though, was the amenities. There is street parking for $1 an hour close to the beach, but because this is also a park, there was a public parking lot for $7/day extremely close to the entrance to the beach. Plus, the entrance to the beach included a large bathroom facility with separate changing rooms and an outdoor shower where people could at least rinse off the majority of the sand, and a lovely playground area for kids. To top it all off, the sand at Isle of Palms even made a much better sandcastle than Sullivan’s. This was a beautiful beach and we will definitely be back. 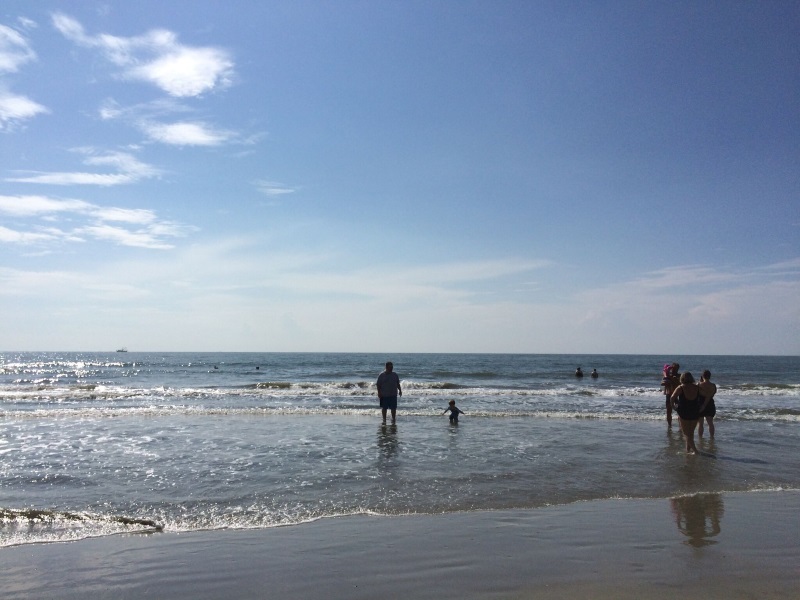 Truly, if you’ve got time to spend at the beach, either Sullivan’s Island or Isle of Palms would be great choices.